First is fulltime Autofocus. One of the banes of DSLR “convergence” cameras has been limited AF ability when shooting video, when compared to dedicated video cameras. Canon, even more than Nikon, has focuses (if you’ll pardon the pun) on eliminating that disparity, and the Canon EOS Rebel T4i basically accomplishes that goal. Canon has also followed the lead of the micro-4/3s camera vendors by introducing truly silent lenses (labeled STM, for their use of stepper motors), allowing autofocus during video without noise on the sound track. Initial models are an 18-135 and a 40mm prime (see below for details). Along with the new focus system there are also plenty of other upgrades to the cameras modes and operation (see the press release below for more details). The camera also features the first touchscreen on a Canon DSLR. I’m not sold on the value of trying to squint at a screen in bright light as the best way to navigate the commands on a DSLR, but as long as they didn’t make it harder to use the traditional command buttons and dials it shouldn’t hurt anything and people are now getting more used to being able to reach out and touch their electronics, so I’m sure it will be popular. The Canon EOS Rebel T4i is now available for pre-order from B&H for $849 for the body only and $1199 with the new 18-135 STM lens. It is expected to ship at the end of June. The camera includes a revolutionary new autofocus (AF) system to help achieve fast, sharp focus and smooth HD video. The new AF system includes a nine-point all cross-type sensor array, and new Hybrid CMOS AF which achieves fast focus when shooting stills or video in Live View mode. Much to the pleasure of aspiring student filmmakers and parents everywhere, the Rebel T4i features Canon’s new Movie Servo AF providing a quiet, continuous AF during HD video recording when using one of Canon’s newly introduced Stepping Motor (STM) lenses. The silent continuous autofocus when shooting HD video helps ensure the camera only captures the sounds of the scene being recorded. When combined with the camera’s new Vari-angle Touch Screen 3.0-inch Clear View LCD monitor II and intuitive “fingertip” controls, touch-menu and advanced still and video capabilities, the EOS Rebel T4i stands as Canon’s most “consumer-friendly” DSLR to date. “Our Rebel line of cameras bridges the gap between the casual photographer and someone looking to advance their photography and capture moments in new and creative ways. The EOS Rebel T4i boasts full HD video with AF and touch-screen navigation, inspiring even more photographers and videographers to explore the creative options made possible with DSLR cameras and lenses,” said Yuichi Ishizuka, executive vice president and general manager, Imaging Technologies & Communications Group, Canon U.S.A.
One of the most significant upgrades to the EOS Rebel T4i is a dramatically upgraded AF system including a nine-point all cross-type AF array, with a high-precision dual-cross f/2.8 point at center. The EOS Rebel T4i is the first Canon camera to feature the new Hybrid CMOS AF system which increases AF speed by reducing the camera’s need to “hunt” for focus. The result is fast continuous AF when shooting photos and movies in Live View. Because the camera’s cross-type AF points have two-dimensional contrast detection, the EOS Rebel T4i provides highly accurate focus regardless of your shot composition and ensures great focus no matter where the subject is located in the frame. The addition of the dual-cross point in the center allows for much faster and precise focusing for photographers using high-speed f/2.8 lenses. 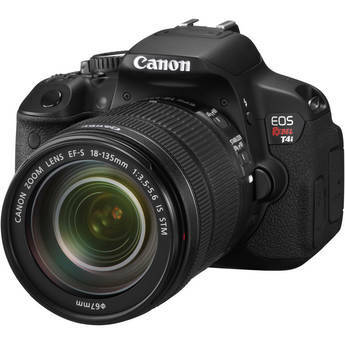 For the first time in a Canon EOS DSLR, the EOS Rebel T4i includes Canon’s new Movie Servo AF for recording video. When used with Canon’s new EF and EF-S STM lenses, the camera can provide smooth and quiet continuous AF while recording video. This technological breakthrough enables the new EOS Rebel T4i to achieve AF while still retaining a DSLR camera’s signature background blur and image quality, producing stunning videos of parties, events, summer vacations or graduations. When shooting video with Canon’s STM lenses, AF also remains silent, helping ensure you only capture the sound of the scene being recorded. The EOS Rebel T4i features a built-in stereo microphone, a first for the Rebel line, that includes an attenuator function to reduce audio distortion in extra loud situations. Another Canon first, the EOS Rebel T4i includes a best-in-class Vari-angle Touch Screen 3.0-inch Clear View LCD monitor II featuring 1.04 million dot resolution for unparalleled, clear viewing. The electro-static touch-panel screen is the most advanced that Canon has released to date with multi-touch capabilities allowing photographers to use familiar gestures such as “pinch-to-zoom” and “swiping” to scroll between pictures. Camera operation has been simplified through this feature allowing for Touch Focus or Touch Shutter controls via the vari-angle touch-screen. The vari-angle touch-screen flips out to the left and rotates 180 degrees forward and 90 degrees backward, making tough above-the-head and low-to-the-ground shots easy, and allowing improved views during photo or video capture. That means the overhead shot taken in a crowd or at a graduation march just got a little easier to shoot. Canon’s new shooting modes (Handheld Night Scene, HDR Backlight Control and Multi-Shot Noise Reduction), take multiple pictures, and combine them – in camera – to help capture a wider dynamic range, minimize the image grain or noise, and produce more vivid colors so landscapes and city scenes are as breathtaking as when seen in person. Canon’s Scene Intelligent Auto mode – the “green” mode on the dial – analyzes the scene being shot, taking into account faces, colors, brightness, movement and contrast, to select appropriate camera settings and help produce the best possible image. This mode has been enhanced to deliver the best possible exposure, particularly when shooting in low-light. To leverage the unique, new shooting functions of the EOS Rebel T4i, such as EOS Full HD Movie with continuous AF, Canon is introducing two new unique lenses, the new EF-S 18-135mm f/3.5-5.6 IS STM lens and new EF 40mm f/2.8 STM lens. Both new STM lenses include Canon’s new Stepping Motor technology, which allows the lenses to smoothly and silently focus, and when used in combination with Canon’s new EOS Rebel T4i Movie Servo AF feature, achieve continuous AF while recording video. The new stepping motor technology in both lenses quietly focuses allowing the EOS Rebel T4i’s stereo microphone to only record the sounds of the scene being shot. The new EF 40mm f/2.8 STM lens offers an ultra-slim, lightweight design that helps photographers avoid overwhelming their subjects with a large lens and to remain discreet in sensitive shooting situations without compromising performance. The “pancake-style” lens boasts an aperture of f/2.8 making it an ideal lens for capturing portrait stills or stunning video. The lens is under an inch thick when attached, making it easy to carry and fit conveniently into a purse or pocket. The EOS Rebel T4i is also compatible with Canon’s previously introduced GP-E2 GPS Receiver that can be mounted to the camera’s accessory shoe. The GPS unit was created to serve outdoor photographers; it records shooting locations including latitude, longitude and altitude, as well as camera direction. A Logging function can tell how far a photographer has traveled as well. The new EF 40mm f/2.8 STM lens and the new EF-S 18-135mm f/3.5-5.6 IS STM lens will also be available separately at the end of June at an estimated retail price of $199.99 and $549.99 respectively. I like your topic,share some more info about refurbished computers.please share more information about topic.